If you want to enter the healthcare field, becoming a CNA is an excellent way. Finding the best CNA classes in Georgia is key to doing it right. Your best approach is to make sure you understand the requirements and only look at approved providers. Test-Guide.com has pulled together a list of the best approved CNA programs (both online and local) below. To find out more information, you can simply enter some information into our request information form here on the site. Learn how to become a CNA in Georgia, including: requirements, approved providers, passing the exam, and finding a job. To be a CNA in Georgia, there are five steps you have to take. These steps are: understanding the training requirements, finding an approved provider, passing the CNA competency exam, getting listed on the Georgia CNA registry, and finding your first CNA job. The details of these five steps is listed below. In order to work as a CNA in Georgia you have to take training from an approved provider, pass the CNA test and get listed on the GA CNA Registry. The admissions requirements for the training providers will vary, but many schools do not require you to be a high school graduate or have a GED. Admissions exams may be required for some schools to insure that you have the necessary skills in reading, writing and mathematics. The minimum education requirements for CNAs are specified by the Federal Government but individually administered by state agencies. In Georgia, the responsibility for the oversight and management of CNAs lies with the Georgia Department of Community Health. Currently, the Federal regulations for CNA education programs are: a minimum of 75 hours of training, and a minimum of 16 hours of training in a clinical environment that is supervised. State approved CNA programs must meet or exceed the Federal standards. Most states (32 at present time) have training requirements that exceed the Federal guidelines. CNA classes must provide training in specified areas. In addition, students are required to complete a minimum of 16 hours of supervised training in an approved clinical setting. The clinical training must cover the following topics: emergency and safety procedures, interpersonal and communication skills, promoting residents' independence, controlling infection, and respecting residents' rights. Basic Restorative Services - self care training; using assistive devices; maintaining range of motion; proper positioning and turning; bowel/bladder training; and using orthotic and prosthetic devices. Mental Health and Social Service Needs - utilizing resident's family for emotional support; responding to resident behavior; awareness of developmental tasks related to the aging process; changing CNA's behavior in response to resident's behavior; and allowing the resident to make personal choices. Basic Nursing Skills - taking vital signs; recording height and weight; caring for environment; recognizing abnormal changes; caring for residents when death is near. Care of Cognitively Impaired Residents - managing needs of resident's with dementia; communicating; understanding behavior; reducing impact of cognitive impairments; and appropriate responses. Residents' Rights - avoiding the need for restraints; maintaining security of personal property; helping resolve disputes and grievances; promoting personal choices; maintaining privacy and confidentiality; and promoting the resident's right to be free from mistreatment and neglect. Personal Care Skills - bathing and grooming; dressing; toileting; helping with eating and hydration/drinking; transferring, positioning and turning; and skin care. Georgia's CNA Education requirements exceed the federal standards. Georgia requires a minimum of 85 training hours of which a minimum of 16 hours must be clinical training. Georgia's approved providers include: high schools, technical schools, colleges, home care agencies, acute facilities and nursing homes. 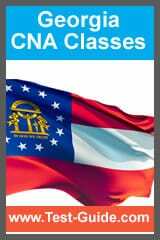 View the complete list of Georgia Approved CNA Classes here. All Georgia CNAs must pass a CNA competency exam. The Georgia Department of Community Health sets the content of the exam, what a passing score is, and which candidates are eligible. Pearson VUE and Georgia work together to develop and administer the CNA exam as part of the National Nurse Aide Assessment Program (NNAAP). The Georgia CNA/NNAAP Exam has a skills examination and a written exam. The purpose of the CNA test is to measure a student's knowledge, skills and abilities of the tasks required to be a nurses' aide. There are 70 multiple choice questions on the written portion of the CNA exam. If you want to know what the questions are like, you should check out Test-Guide.com's CNA Practice Test. There are 22 CNA skills that are taught in your classes, you will be tested on five randomly selected skills. Hand-washing will always be one of the tested skills. To pass the skills test you must successfully complete all five of your tested skills. The current examination fees for the Georgia NNAAP Written Examination and Skills Evaluation are $112. You can find more information by viewing the Georgia Nursing Assistant Candidate Handbook (PDF). You must get listed on the Georgia Nurse Aide registry before you can work as a CNA. Georgia facilities will need to verify that you are currently listed on the registry. You will be listed on the Georgia Nurse Aide registry after you complete your approved training program and successfully pass the written and oral skills examinations. You will have one year after taking your classes to pass the CNA exam. Your listing on the registry will be valid for two years. Every two years you will need to fill out a renewal form which will ask you to provide proof that you have worked as a CNA (for pay) for a minimum of 8 hours under the supervision of a nurse. Georgia recognizes CNAs from other states if they are currently in good standing on another state's registry. If you are a CNA from another state, you will need to fill out a reciprocity form which is found on Georgia's CNA web portal. Georgia allows you to perform online searches of the Nurse Aide Registry from their website. You can search the registry by last name, first name, social security number or certification number. The state also maintains the following forms online: renewal, reciprocity, change of name, certification card request, and change of personal information. Nurse Aides/CNAs help care for hospital patients or residents of nursing homes or long-term care facilities. There is an increasing demand for CNAs, much like most healthcare workers, because of the aging population. Nationwide CNA employment is expected to grow over 20% over the next decade. About 1,460 CNA jobs are expected to open every year in Georgia, which is a 21% growth rate. The median salary for CNAs in Georgia is $10.428 per hour, which is equivalent to $21,700 per year. The median CNA salary across the United States is $12.07 per hour or $25,100 per year. A healthcare career is very desirable for many job seekers. A CNA education provides a somewhat easy entry to the market. CNAs sometimes further their career by becoming a licensed (LPN) or registered (RN) nurse. Georgia Piedmont Tech. College-Continuing Ed. The Oaks Nursing Home, Inc.
New Horizons Medical Institute, Inc.
Georgia Northwestern Technical College-Walker Co.